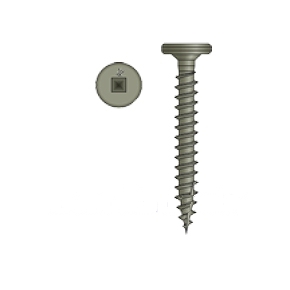 PRODUCT: #10-12 x 1" Pancake Head Metal Roofing Screw, 410 Stainless Steel, #2 Square Drive, Type-17 Sharp Point, Strip Collated Simpson Quik Drive PC Series. 1500 Screws/Box. Price/Box. 410 Stainless Steel. 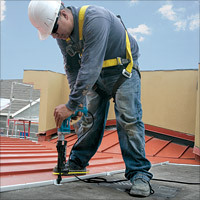 Also available in clear zinc coatings and Quik Guard®. Simpson Quik Drive #10 x 1 inch Panhead Clip Attachment Screws, #17 Sharp Point, Zinc Plated, Collated. Metal Roof Clip Attachment. 1500 Screws/Box. Price/Box. Simpson Quik Drive #12 x 1 inch Panhead Clip Attachment Screws, #17 Sharp Point, Zinc Plated, Collated. Metal Roof Clip Attachment. 1500 Screws/Box. Price/Box.